We caught up with Rahanna and Owen before the season finale tonight. 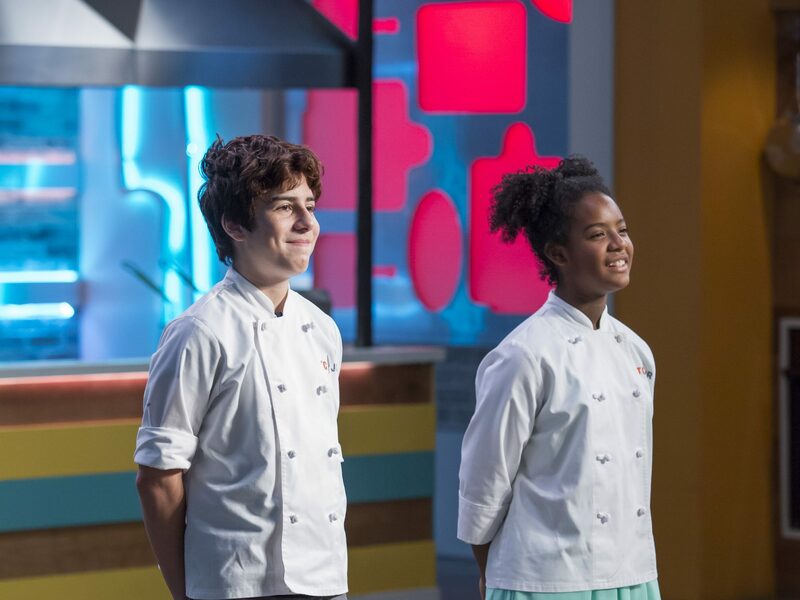 The finale of Top Chef Junior airs tonight at 8pm ET on Universal Kids. Cancel all your other plans. The show, which kicked off on October 13, garnered 10 million unduplicated viewers in its debut season, and it’s easy to see why. If you’ve already been inspired, moved and impressed by the cast of 22 young chefs, ages 11 to 14, you don’t need convincing. If you’re just tuning in for the first time, get excited. It’s clear that both young chefs joined the show because they love to cook and want to improve. As head judge Curtis Stone, chef and owner of L.A.’s Gwen and Maude, puts it, “there’s no ego.” All of the contestants took feedback really well, he recounts. What’s amazing is how skilled and knowledgeable they are already, with an encyclopedia of chefs, restaurants and dishes rolling off their tongues. Over dinner, Rahanna lit up recounting the time she met Alice Waters, and Owen excitedly rattled off all the fine dining landmarks he wants to try, referencing specific dishes that have been etched into the cannon of molecular gastronomy. Remarkably, they’re both largely self-taught. “A lot of cookbooks and YouTube,” Owen explained. F&W Special Projects Director and Top Chef judge Gail Simmons, who was a guest judge on Top Chef Jr., points out that these young chefs and their counterparts grew up with a modern sensibility in the kitchen; sous-vide is like second nature. Motivated, savvy and passionate, they’re the next generation of chefs you want in the kitchen. Tonight, they’ll both be having viewing parties at home. But on the evening before the finale, neither one was too preoccupied with the end result. Rahanna is focused on getting back in the kitchen, cooking for her brother and sisters at home or in a restaurant somewhere. Owen is looking forward to opening a pop-up in Chicago with fellow-contestant Henry, who made it to the final four. The rest of us will be watching as they step into the spotlight and join the country’s next generation of great chefs.